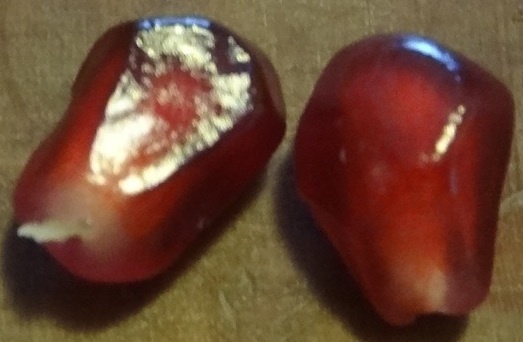 Botanically, the juicy, often ruby-red part of the pomegranate seed is a sarcotesta, a modification of the outer epidermal cell layers in the seed coat (the testa). Pomegranate fruits often split when they are quite ripe, exposing the bright red sarcotesta to hungry birds and, apparently, goddesses. There is a common misconception that the juicy part is an aril, not a sarcotesta. An aril is an outgrowth from a particular point on the seed, like one of its ends, or of the funiculus, which attaches the seed coat to the ovary wall in the fruit and is the plant equivalent of an umbilical cord. The fluffy fibers of cotton (Gossypium sp. ; Malvaceae) are arils. 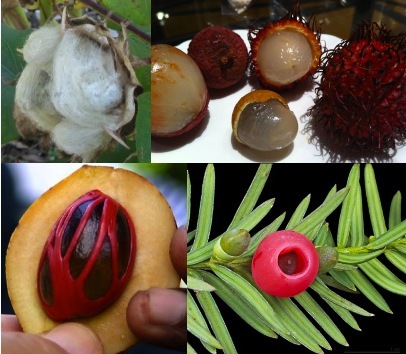 So are the delicious parts lychee (Litchi chinensis), longan (Dimocarpus longan), and rambutan (Nephelium lappaceum) fruits from the Sapindaceae. The red aril surrounding the seed of the gymnosperm conifer yew (Taxus) is technically edible–sweet but bland, I’m told–but everything else on the yew plant, especially the seed inside the aril, is deadly poisonous in minute amounts to most creatures except birds and deer. The genus name Taxus comes from either taxic or toxic, which in Greek means “that in which arrows are dipped.” I can’t fathom why the thing is a common landscaping plant. Maybe it’s those pretty arils. Speaking of pretty arils, the spice mace is a lacy aril around the nutmeg seed, forming a two-for-one spice from Myristica fragrans (Myristicaceae). Some arils are particularly rich in lipids (fats) and are called caruncles or elaiosomes. While birds and mammals are happy to avail themselves of these, they are particularly attractive to ants. 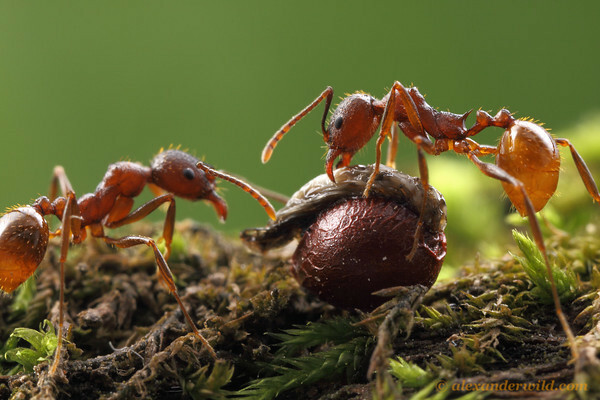 An ant drags the well-protected seed by its elaiosome down into its underground nest. Colony ants eat the elaiosome and put the seed itself on their underground compost pile, along with dead ants and other organic waste generated by the colony. In doing so, the ants have done the seed a great favor by planting it underground in a big pile of fertilizer and guarding it from other would-be seed eaters. Some invasive plant species, such as leafy spurge (Euphorbiaceae) in the United States, employ elaiosomes, and their march across their new frontier is likely aided by ants. This mutualism with ants, called myrmecochory, is so successful that it has been mimicked by walking stick insects (Diapheromera sp. ; Phasmatodea). Walking stick insects are so named because they resemble twigs or leaves on the plants that they eat. Their eggs resemble plant seeds complete with a fatty mimic elaiosome, called a capitulum. Just like a seed with an elaiosome, the ants haul the egg down into the nest, eat the capitulum, and throw the unharmed egg onto the compost pile. When it hatches on the pile, the young walking stick looks and smells like an ant, and it thereby finds its way out of the nest unharmed and heads to the nearest suitable plant. In angiosperms the herbivore-attracting structure is usually a fruit, in both the botanical and colloquial sense, as we explain below, but arils, sarcotesta and modifications of other floral structures are quite common. Arils and sarcotesta have independently evolved numerous times in most extant major clades of both angiosperms and gymnosperms. Myrmecochory mediated by lipid-rich elaiosomes alone has independently evolved between 101 and 146 times during plant evolution and is present in 17% of angiosperm plant families (Lengyel et .al. 2010). Sarcotestal seeds pop up in a few gymnosperms and in 17 angiosperm families on far-flung branches of the plant phylogeny (Werker 1997). Recall that the evolution of flowers defines the angiosperms, so gymnosperms don’t have flowers or fruits (see our exceedingly brief history of plant evolution for a refresher if necessary). The name gymnosperm means “naked seed,” as the seeds are simply borne on cone scales or stalks and lack a protective fruit. Therefore, a fleshy aril, as in Taxus, or sarcotesta, as in Gingko biloba, are among a gymnosperm’s limited options for producing a nutritious reward for an animal seed disperser. Gingko’s sarcotesta is full of foul-smelling butyric acid, which also forms when butter goes rancid, so woe to any person who walks on a sidewalk lined with female gingko trees when the seeds drop. Many animals, however, don’t seem to mind the odor and are likely drawn by it. The sarcotesta of familiar angiosperm papaya (Carica papaya) seeds, though, adds a pleasant sweetness to a papaya seed vinaigrette. The seeds themselves have a peppery mustard flavor, giving away the membership of the papaya family (Caricaceae) in the Brassicales order, named for the mustard family (Brassicaceae). To make the vinaigrette, cut open your ripe papaya, save out a few seeds to impress your dinner companions, and scoop out the rest of the seeds and throw them in the blender (or mortar and pestle) with lemon juice, salt, and olive oil (and an optional egg yolk and/or an anchovy filet for a papaya seed Caesar). Exact proportions of ingredients depend on your preferences and the size of your papaya. The high frequency with which fleshy sarcotesta and arils pop up in the global flora demonstrates the evolutionary old age and relative lability of both animal dispersal of seeds and the structural devices plants use to attract said dispersers. The wall of the ovary stratifies into different tissue layers of the pericarp of the fruit. Katherine described this stratification in stone fruits: the exocarp is the peel, the thick mesocarp is the sweet pulpy part, and the endocarp is the hard outer layer of the “stone” of the fruit, protecting the seed inside. 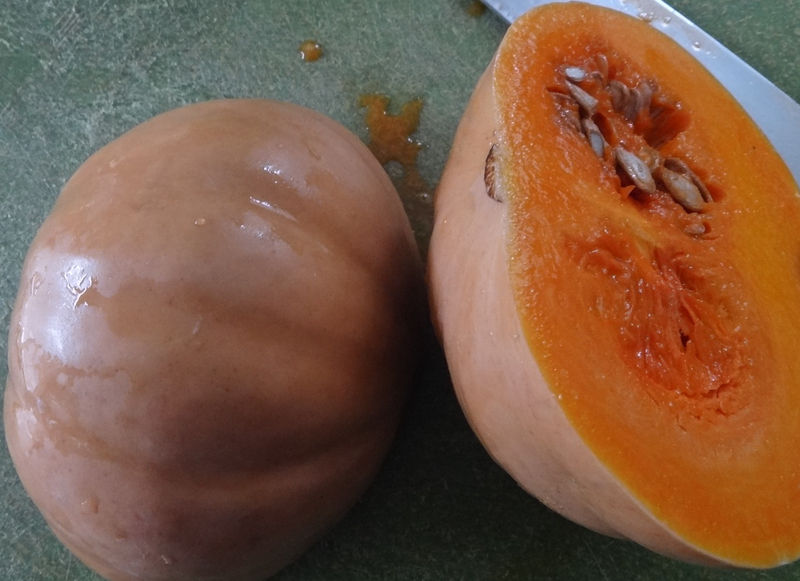 The endocarp of other fruits may be soft instead of stony, like much of the pulpy, stringy tissue surrounding seeds in squashes (Cucurbita sp.) 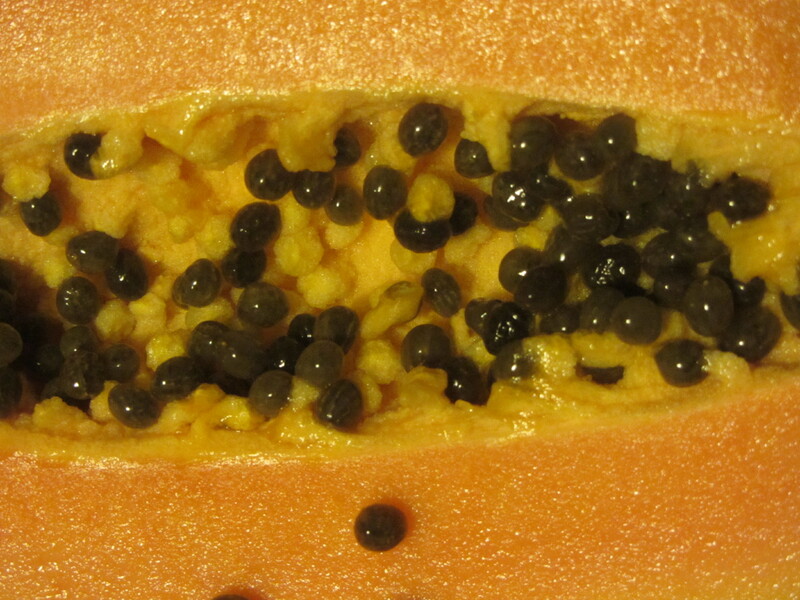 or papaya (Carica papaya) (some of these strings are funiculus). Some plants bear what are (inconsistently) called multiple fruits, in which the mature edible structure is constructed by the fusion of several fruits developing from multiple ovaries within a single flower (as in raspberry or blackberry) or from multiple individual flowers arrayed on an inflorescence (fig, mulberry or pineapple). If any part of the flower other than the ovary wall becomes all or part of the enticing structure, the result is called an accessory fruit. The receptacle supporting the flower often becomes all or part of the sweet, attractive accessory fruit, but it has different ways of doing so across the global flora. Often, the receptacle, along with tissue from the calyx (the whorl of sepals), gets roped into the animal attractant role simply because it protects the ovary, so as the ovary wall grows into a fruit, the receptacle around it must grow too, and become fused with the pericarp on the inside and something pretty to look at for an animal on the outside. This is the case for plants whose flowers have an inferior ovary. 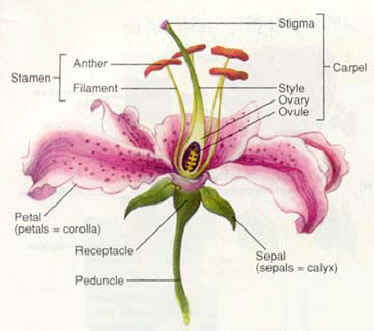 The use of ‘inferior” here is physically descriptive and is not a commentary on quality: the ovary is physically located below the calyx whorl of sepals, buried within the receptacle (see diagram). Contrast this with a “superior” ovary and intermediate cases. Many familiar plants develop charismatic fruits from inferior ovaries. In bananas, squashes and melons, the receptacle tissue simply fuses to the exocarp and does not become sweet and juicy itself. In contrast, the fleshy, red part of the wintergreen (Gaultheria procumbens; Ericaceae) “berry” is the calyx and receptacle surrounding the dry capsule fruit. In many pome-type fruits, like apples and pears (Pyrus sp. and Malus sp., respectively; Rosaceae), the receptacle becomes fleshy, as does part of the pericarp underneath it. The place where the two tasty tissue types fuse can sometimes be seen in a cut apple (see picture). 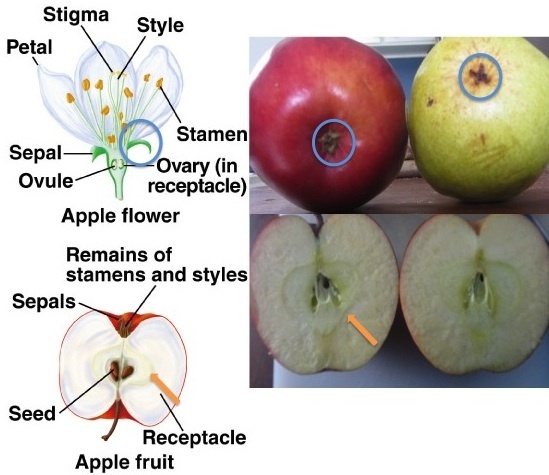 In pomes, the endocarp is the leathery “core.” The remnants of the calyx or even the anthers and stigmas often remain on these accessory fruits (see apple and pear picture) from inferior ovaries. The receptacle may become an attractive accessory fruit even if the flower has one or more superior ovaries. Strawberry (Fragaria sp. ; Rosaceae) flowers have multiple superior ovaries, each with its own stigma and style. 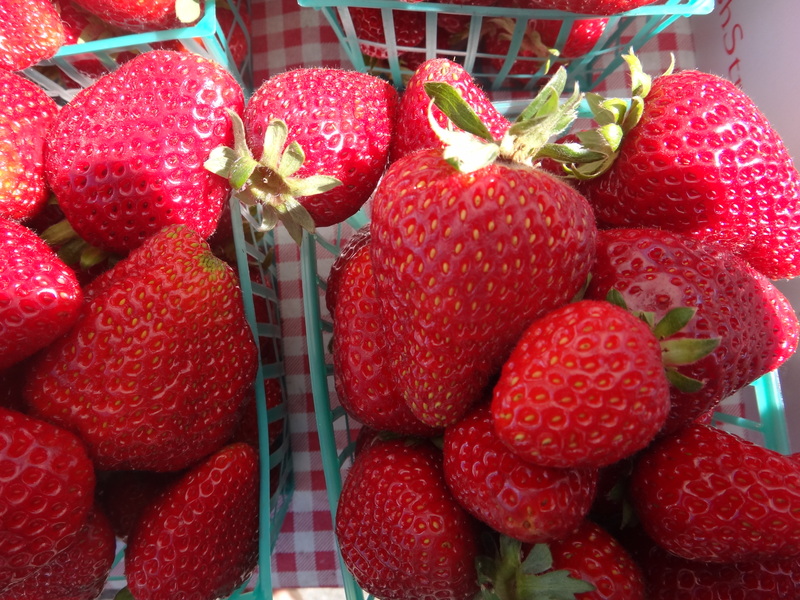 The red fleshy part of a ripe strawberry is the receptacle. As the receptacle grows and expands into the red strawberry, it pushes the ovaries apart from each other, and each ovary develops into a little fruit called an achene. These achenes are commonly perceived as “seeds” on the surface of the strawberry, but they are bonafide little fruits, each with a single seed inside it, fused to the achene wall. Often the style is still attached to the achene, which you can see as a little thread. Most Americans are familiar with cashew (Anacardium sp.) nuts, but few are familiar with the curious structure that bears them. 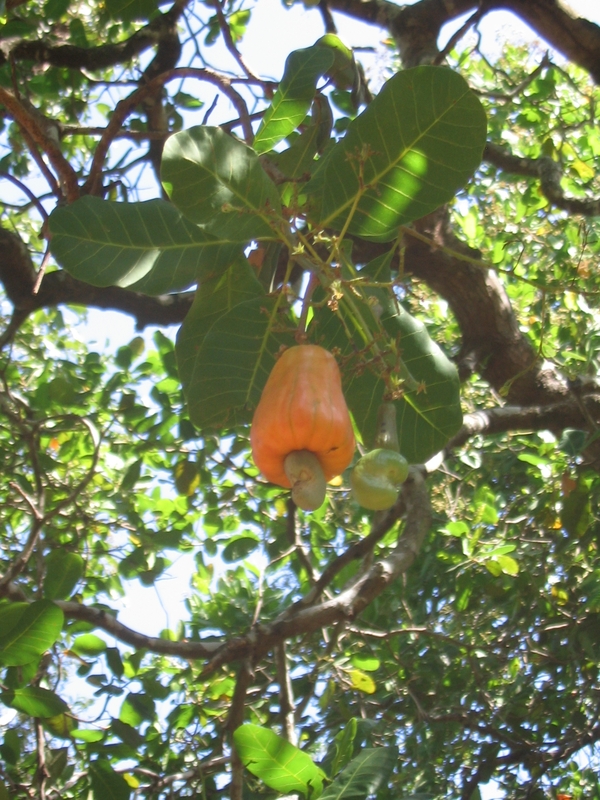 The juice from the “cashew apple” or marañón, is popular all over the tropics, where cashew trees are widely grown. The fleshy, pear-sized red or yellow marañón (see picture) also develops from the pedicel and receptacle. The actual cashew fruit is a green, inedible drupe (like a stone fruit) that dangles from the end of the marañón and is shaped like the cashew nut inside it. The green drupe tissue surrounding the cashew nut is utterly inedible due to its high content of anacardic acid, which is chemically similar to the better-known urushiol, the irritant oil from poison ivy, poison oak, and poison sumac, which are in the same family as cashew (Anacardiaceae), along with mango and pistachio. The irritant must be removed chemically or with fire before the cashew nut can be eaten. Now you have almost all the information you need to interpret pomegranate structure. 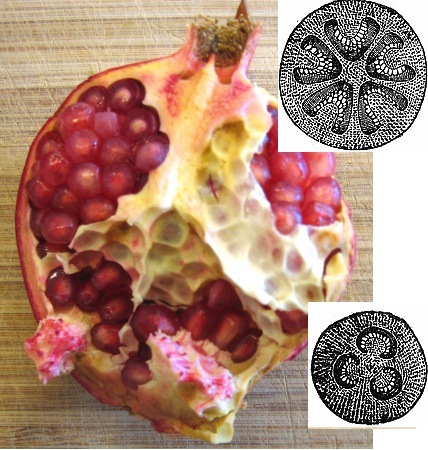 The persistent calyx from the flower (see flower photos above) on the ripe fruit is particularly conspicuous in pomegranate, and sometimes inside it you can still see the numerous anther filaments and the style (see fruit photo below). 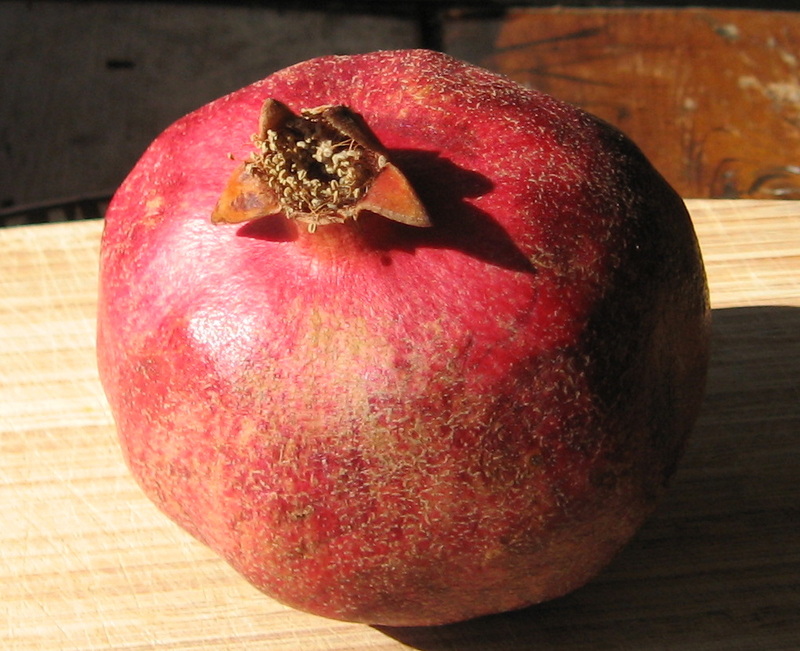 Therefore you know that pomegranate fruit develops from an inferior ovary, and the tough, red outer rind is the receptacle fused to the pericarp. 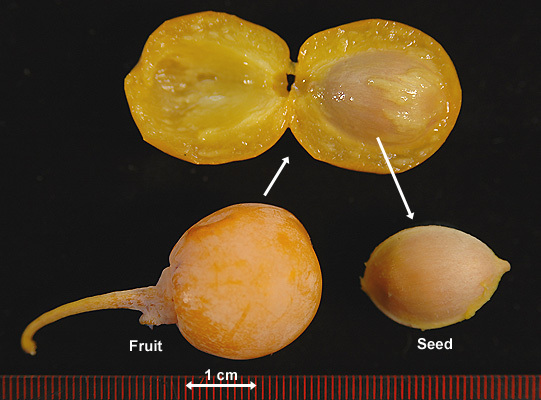 The arrangement of the sarcotestal seeds within the fruit, however, is a bit unique. To understand why, it is useful to look at the simpler wild pomegranate, P. protopunica, which is the only other species in the genus Punica and the putative ancestor of cultivated P. granatum. P. protopunica is wild only on the island of Socotra, part of the Republic of Yemen in the Indian Ocean. The earliest (Bronze Age) archaeological records of the genus are from the Arabian Peninsula, the closest mainland to Socotra. The fruits of P. protopunica are smaller, structurally simpler, and have less sweet seeds than the cultivated species. At some point during the domestication of P. granatum, the number of layers (whorls) of carpels (chambers of the ovary) went from one, as in P. protopunica and the vast majority of plants, to two or three. The illustration above shows a cross section of P. protopunica flower and fruit (in the green box) and fruit of P. granatum with two layers of carpels. 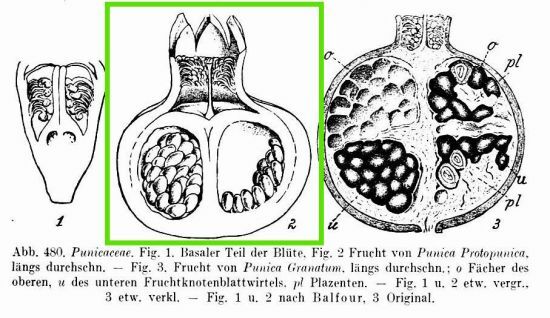 Often, however, a cross section of the real P. granatum won’t look as perfectly grid-like as this illustration (see photo below), as the seeds in different regions of the fruit develop at different times, which twists the entire internal structure of the fruit. Pomegranate halved longitudinally with digram of cross sections of upper and lower carpel whorls. Notice the persistent calyx and stamens. Diagrams from Watson and Dallwitz (1992). The lower whorl has up to three carpels with axial placentation of the seeds, meaning the placenta tissue from the pericarp is in the middle of the fruit, whereas the upper whorl has up to 6 carpels with parietal placentation, meaning the ovules develop from the outer and lower parts of the carpels. The white membrane that covers the tops of the seeds is the septum that separates the carpels. The seeds are embedded in spongy white tissue from the pericarp called placenta, which is structurally very different from the placenta in mammals but serves a similar function. The septa separate easily from the tops of the seeds, and the seeds are most easily and least messily removed from the pericarp in a bowl of water. The seeds will sink, and the pericarp will rise. As the daughter of the original botanist, presumably Persephone knew all of this, even if she didn’t know that being a diligent seed disperser would land her in the underworld. Many special thanks to Missouri Botanical Garden (www.mobot.org) curators Shirley Graham and Roy Gereau for extraordinarily helpful conversations about pomegranate and Sapindaceae fruit structure, respectively. Lengyel, S. et al. (2010). “Convergent evolution of seed dispersal by ants, and phylogeny and biogeography in flowering plants: a global survey”. Perspectives in Plant Ecology, Evolution and Systematics 12 (1): 43–55. doi:10.1016/j.ppees.2009.08.001. Watson, L., and Dallwitz, M.J. 1992. The families of flowering plants: descriptions, illustrations, identification, and information retrieval. Version: 19th December 2012. http://delta-intkey.com. Werker, E. (1997). Seed Anatomy. Borntraeger, Berlin and Stuttgart, Germany. This entry was posted in Fruit, The basics, Uncategorized and tagged accessory fruit, angiosperm, aril, flower structure, fruit, Jeanne L. D. Osnas, pomegranate, Punica, receptacle, sarcotesta, structure. Bookmark the permalink. Kiwano is another fruit where you eat the fleshy seed coat. Cool, so kiwano seeds have a sarcotesta? I think mangosteen might have fleshy arils, but I haven’t confirmed that with a reputable botanical source. I’m sure I must have missed several charistmatic examples of both sarcotesta and arils and would love to be made aware of them, so thanks so much for bringing kiwano to my attention! Excellent post. If I remember correctly, pomegranates are a rich source of punicic acid, which is supposed to be good for you.